In order to meet exhibitor and visitor needs more effectively and further bolster its status as a leader, Silmo is undergoing a major facelift. No longer just a trade fair, it is now spotlighted as the world’s largest flagship store dedicated to vision. Under one roof, it brings together the optic sector’s most comprehensive offering, confirming its role as a key driver of business for all its participants. This 2015 edition marks a new departure. This is the first time a professional trade fair has positioned itself as a flagship store, reaffirming its reputation as the most comprehensive showcase of an entire sector. Conveying a sharp contrast, the visuals feature characters in black and white, each holding a Silmo bag. The duotone effect produces a visual shock that instantly draws the eye... An ambience in which fashion and style generate new business. 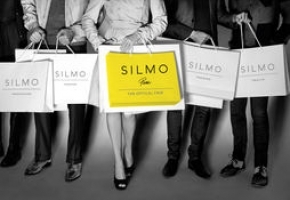 The campaign reveals the new Silmo’s true personality, characterised by high visibility and distinction. Silmo’s branding (logo and brand persona) have also been revamped. Its visual identity has a more streamlined look, adding a touch of chic sophistication. Thanks to these new communication tools, the optics sector’s centrepiece event sets out to make a bigger impact, enhance its visibility and attract new visitors... a win-win situation for everyone involved.